Afternoon slump? Stressed over your workload? 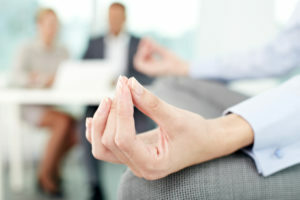 Take a few minutes for yoga at the office. That’s right, at the office. Yoga can help you get through a crazy day by lowering your blood pressure, increasing serotonin, and decreasing cortisol. Yoga also helps you focus and releases tension in your limbs. Try these 12 poses at your desk to help you power through your day. Alignment Points: Imagine a clock right in front of you, and circle your nose around the clock. Reverse directions. If you feel any pain, stop! Benefits of Pose: Softens and loosens neck muscles. Links movement to breath. Alignment Points: Sit tall at the front edge of your chair with your feet set firmly on the floor. Make sure your back is off the chair. Watch to make sure your spine is not curled. Your heart is at center with your chin moving forward. Your shoulder blades are pulled back. If shoulders are tight or there is pain in the shoulders, keep your arms low on the chair. Benefits of Pose: This simple pose works as a heart opener. Stimulates immune system. Opens upper respiratory muscles. Stretches shoulders and arms. Increases awareness of the action of the shoulder blades. Aids in digestion and stretches belly. Alignment Points: While doing cow pose, make sure that your chin is not jutting forward to avoid cervical spine compression. Benefits of Pose: Softens and lubricates the spine and muscles. Creates space between vertebrae and increases circulation. Stretches secondary respiratory muscles to help aid in better respiration. Alignment Points: Make sure your back is off of the chair. If you have a block to rest behind the chair at your lower back, this can assist in supporting a tall spine. Draw circles with your elbows in both directions. Benefits of Pose: Softens and loosens shoulder girdle muscles. Links breath to movement. Warms up the synovial fluid within the shoulder. Helps to release tension. Alignment Points: Make sure your back is off of the chair. Sit tall and place one hand firmly into the cushion of the chair for stability. Lift the opposite arm up and over. Watch to make sure there is no sinking in the arm or spine. Benefits of Pose: Aids in respiration. Stretches rib cage and lengthens side body. Alignment Points: Make sure your front foot is on the ground. Drop your outside knee down. Keep the top of your foot gently pressing onto the floor, or flex your toes so that the ball of your foot is pressing down for stability. Hold onto the chair and lean back. Benefits of Pose: Stretches hip flexors, psoas, quadriceps and torso muscles. Aids in digestion. Alignment Points: Sit tall at the front edge of the chair with your toes facing forward and feet flat on floor. Keep your ankles under your knees. Cross an ankle over your shin either under or above the knee. If above knee, place supporting foot under supporting knee. Lengthen up and hinge forward with a straight back, leading with the heart and chin. Hold for three to five deep breaths. Repeat on the other side. Benefits of Pose: Aligns shoulders. Stretches back and hip muscles. Alignment Points: Keep your spine in good alignment with head, neck and spine in one line. Tuck your chin in a bit and gently lift shoulders up, back and down the back. Keep knees in front of hips with your ankles under knees and all ten toes facing forward. Benefits of Pose: Increases awareness of posture overall, especially the spine. Strengthens all core muscles of torso and allows more space for organs to perform optimally. Alignment Points: Sit up straight, firmly on your chair with your feet pressing into the floor for stability. Lift both hands under the right knee up to your chest, and then lift your left knee up to your chest. Benefits of Pose: Releases tension in back and hip. Gentle squeezing action helps the digestive system. Alignment Points: Sit tall and lean forward resting forearms on thighs. Tuck chin, head, neck and spine in a long line. Inhale deeply and exhale a complete three to five breaths. Benefits: Releases tension in lower back and relaxes the nervous system. Alignment Points: Turn to the side of your chair. Keep feet on the floor with good alignment through the joints. Lift your arms up to shoulder height keeping your shoulders parallel, and then rotate towards the back of the chair and rest your hands down. Hold for three to five breaths. Repeat on other side. Benefits of Pose: Stretches torso, ribs and respiratory muscles. Massages internal organs. Alignment Points: Make sure your back is off of the chair. Watch to make sure the spine is not curled. Heart center and chin moves forward. Benefits of Pose: Aligns shoulders. Stretches and strengthens back and core muscles. Stretches inner thighs and opens hips. Helps balance tightness in groin, which impacts the knees and lower back. Increases awareness. Take a few minutes during your work day to do these simple stretches. They’ll help you offset stress and clear your mind.